One of the biggest challenges we have had to address is how to handle the many complex depend data pipelines/workflows necessary to load data into the database, transform it, and perform other domain specific processing. Rather than re-invent the wheel we carefully surveyed the available open source data pipeline and ETL tools. We narrowed down on Apache’s Airflow project started at Airbnb. What it does is pure magic! 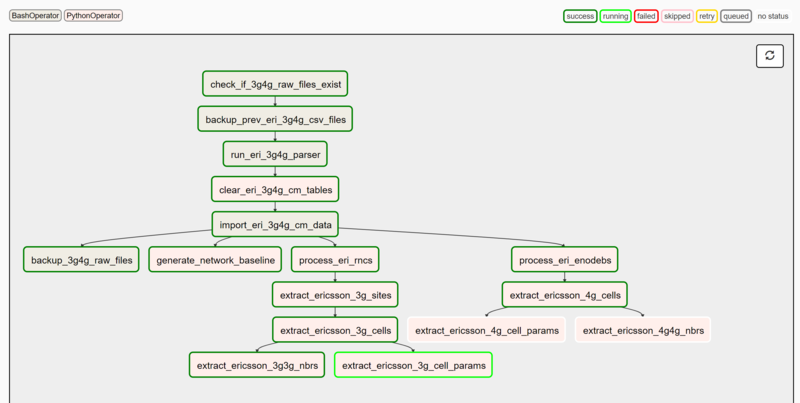 Below is a sample of the Ericsson 3g4g ETL process defined as a DAG(Directed Acyclic Graph) in Airflow. Each dependency is clearly defined and easy to track. The next figure below shows the duration of the entire process with the time each sub- task took displayed in a Gantt chart. Identifying which process is the bottleneck become a trivial task.